Hello, my name is Kyle Barkett and I am from Muskegon, MI. I study Business/Economics at Wheaton College outside of Chicago. I came down to Honduras because I am very interested in finance, development work as well as helping to relieve poverty. To wrap up the end of my first week in Honduras as a UMF intern, Patrick Hughes and I woke up at 4 am to travel to San Pedro. The purpose of our long journey was to attend the Honduran National Cup of Excellence Competition. This is an annual coffee competition where coffee farmers compete nationally to have their coffee bought at higher prices. Coffees that place in the national competition get auctioned off, and as a coffee farmer’s place in the competition rises so does the sales price of his coffee. Coffee farmers qualify by producing at least 4,000 lbs. of a single coffee and entering it to be judged by international coffee buyers. Last year’s winner sold for $22 a pound and others that placed were auctioned at prices from $6-13 per pound. Even though I personally do not drink much coffee, attending this event was fascinating. Humble rural farmers from all over the country gathered in an urban setting for their coffees to be judged. These farmers are able to meet international buyers and be recognized for the quality of their coffee. 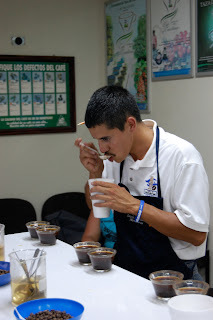 While I sat back and watched all this unfold, Patrick was able to do some awesome networking, meeting the best coffee farmers in the nation, international coffee buyers, IHCAFE engineers, and other Hondurans involved the specialty coffee. The awards ceremony was held in a very lavish conference center where one of the Vice Presidents of Honduras, the President of the National Coffee Fund and other important people in Honduran coffee handed out the awards. At this important event one would expect wealthy businessman with thousands of acres of coffee to compete, but in reality the farmers were rural farmers with small amounts of land. These farmers from very rural parts of Honduras have traveled a very long way to come to the competition. It was truly amazing to see these farmers come up on stage and be acknowledged and applauded by some of the most high-end and important people in the nation. This could be the only time in these farmers’ lives they are regarded with such high esteem. It took many farmers a while to adjust to the acclaim because they are not used to any acknowledgement. These farmers have toiled over their land in extremely high altitudes in order to produce this quality coffee, and I hope they continue to be recognized in this fashion for their accomplishments. This competition shows the importance of trying to produce quality coffee and not just quantity. Most coffee farmers are not concerned about the quality of their coffee because local intermediaries buy all coffees at the same price no matter what. These intermediaries just mix all the coffee together and in this process all quality is lost. If quality is encouraged, Honduran farmers and driers will improve their practices to preserve and improve quality, and Honduran coffee will be associated with quality. When I began searching for an internship last fall, I was not sure exactly what I was looking for. I started with the typical ideas of a position within a banking or accounting firm. I always had an interest in numbers and finance, but after talking to people in the industry and attending countless forums, I realized it was not for me. The idea of manipulating spreadsheets for hours on end simply did not appeal to me like I hoped it would have. (Well, okay... to be honest, I never really hoped that spreadsheets would appeal to me.) After hearing stories from speakers at forums and classmates pursuing these careers, it became clear that I would not be happy in such an environment. So I went back to the drawing board, starting with my biggest passion--travel. The moment I discovered the internship program offered by Unión MicroFinanza, something clicked. I began having conversations with Daniel, UMF’s internship coordinator, about the program, the organization, and what it all entailed. It quickly became apparent that I had finally found an internship opportunity that fit. I have been in Honduras for two weeks now, and to say my excitement has grown since I arrived would be an understatement and for good reason--my work with UMF is already in full swing, and words do not justify how much I am learning every day. Besides everything I have learned about microfinance, agriculture, and the people of La Unión, I’ve gained an incredible insight into the nuances of international business and how world markets affect small communities like La Unión. The crew at Unión MicroFinanza wasted no time getting me involved. On my third day after arrival, I went on a day trip with Michael De Wit, UMF's Director of Honduran Operations, to the UMF coffee exporter in the city of Santa Rosa. We began by weighing the coffee to be sold, then loaded tons--literally 20 tons of coffee!-- into the trucks and hauled the coffee off to be sorted. Of course, this is a third-world nation, and not everything goes according to plan—which is a critical lesson to learn here. After one of the trucks broke down, I realized this was no longer going to be a simple day trip. With plenty of time to kill as I waited for Michael to return with the other truck, I went off and met a few locals who were ecstatic to meet me and hear about the objectives set out by Unión MicroFinanza. Just another reason the culture is so appealing to me. We eventually completed our mission and made it back to La Unión around dinnertime the next day. All in all, it was quite the voyage. As exciting as this whole venture was, it is only a small portion of the process. Of course, exporting the coffee for sales in the States is a critical step, but there is so much more to it. This last weekend tied it all together. 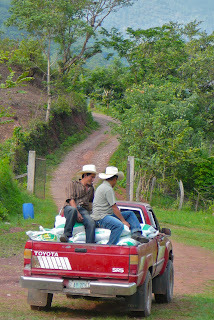 From processing loan approvals to receiving truckloads of fertilizer to finally distributing the loans to all of the producers, the process came full circle and I now understand what UMF does and how the people of Honduras are actually benefiting from the services provided—and what I am doing to help. With ten more weeks to go, undoubtedly there will be many more adventures to come, people to meet, and stimulating work to carry out. With everything that I’m learning and all the friendships that I am forming, I am sure I will look back on this internship one day and be sad it ever ended. Yet I am equally sure that I will be proud of the goals and accomplishments I realized. 12: Fresh mangoes I've eaten. 10 lempira (50¢) a piece, and scrumptious. 0: Times I've shaven. My face is somewhere near the intersection of manly, ugly and lazy, but I've had a great time just not caring. 102: Spanish words we've taught to French-student Kyle. Almuerzo (lunch), licuado (smoothie), and the first hundred numbers. 4: Things I've done that I was completely unqualified for ten days ago. From impact analysis to farming, I've been learning at an exponential rate with no sign of slowing. 1: Attempt at running. Up a rocky, muddy mountain in 90° heat and 1000m elevation. 17: Times I've heard "Cada Día" by Jesús Adrian Romero. After 4 or 5 plays on repeat at Alicia's (our daily dinner spot, music choice courtesy of Alicia's ~7-year old daughter), I put on a monumental display of patience and persistence to download it myself. I can already tell you it's going to be the theme song of my trip. 2: Mornings working a milpa. Now you might not know what a milpa is. Neither did Josh, so don't worry you're in good company. It means various things throughout Mexico and Central America, but here in La Unión it just refers to a cornfield. 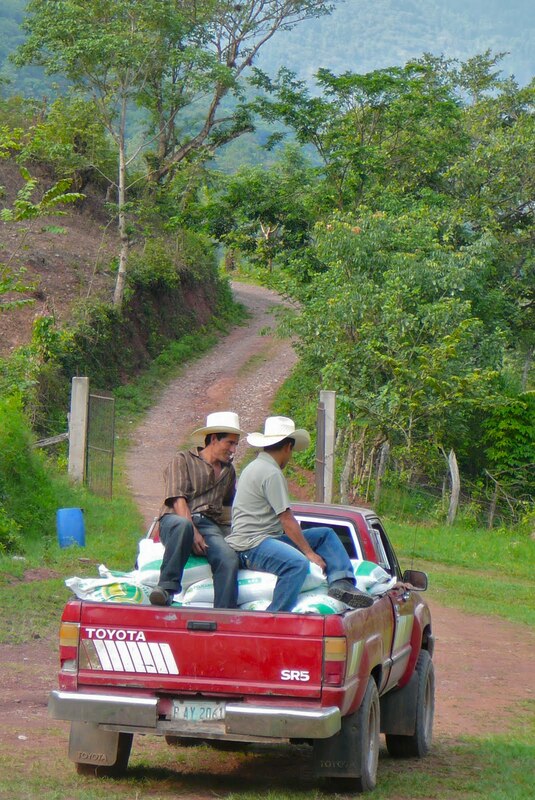 Milpas tend to be small with crops going to feed the family rather than for a profit. Gilberto Barrientos is a UMF employee, a La Unión native, and a great guy, so in an effort to help him out and get some personal experience with the life of a Honduran farmer, I and the other interns spent two mornings working on Gilberto's milpa. We hit the fields at 6:30 with piochas (pickaxes) and a big metal pole (see picture), and got to work tilling. 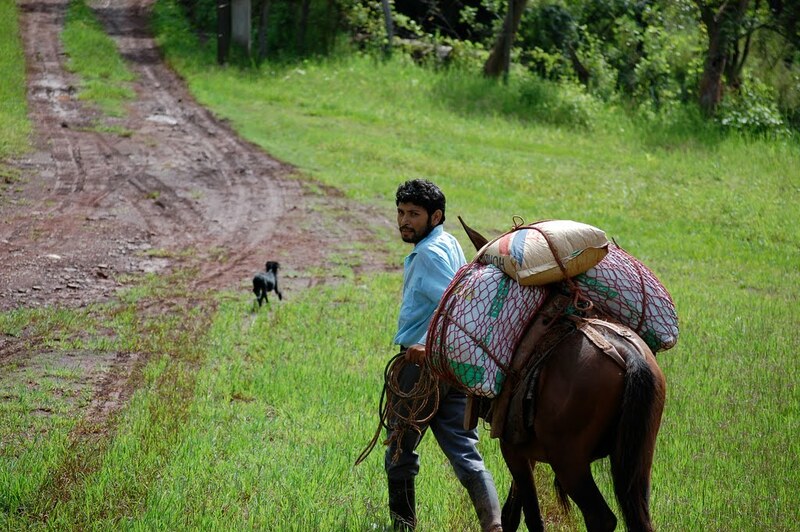 The milpa was in a picturesque spot, surrounded by miles of mountains and emerald green foliage. But it was early. And it was hot. And it was hard. Ten minutes in I was sweating bullets and grunting like a caveman. Blisters were growing and getting ripped off faster than you can save money with Geico and my back was breaking. The point is, after just eight hours over two days we were exhausted. I don't know if it's fair to say I gained an understanding of the Honduran farmer's life, because I honestly can't imagine working like that all day every day. However, I certainly did come out with a new appreciation for the work that I'll be doing over the next three months and what it can mean to the people of La Unión.